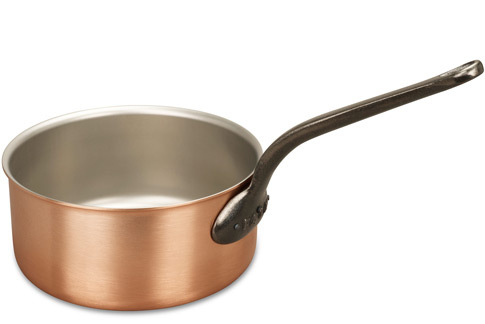 We know you'll love this	24cm copper saucepan	as much as we do. excellent beauty Can be used for almost any kind of dish. I love looking at it, and I look at it every day. 1083 customers found this review helpful. Did you? Yes, I did! Heat retention A wonderful pan for cooking large quantities of food where an even heat spread is required without having to use a very powerful burner. This also helps reduce "boiling over". 1066 customers found this review helpful. Did you? Yes, I did! Great for big volumes Perfect for big volume cooking. Pasta etc. is a breeze and the size is great for family meals. The pan, because of its size, is very heavy especially when full of liquid so not easy if you are frail but other than that a perfect pan for large quantities. 1023 customers found this review helpful. Did you? Yes, I did! Perfect! This is the perfect pan for everything! Sauces, pasta, macaroni cheese (a favourite with my colleagues!) We received the pan very quickly and with A* service from Neil as always. 1007 customers found this review helpful. Did you? Yes, I did! what's not to love? I have this and the 16cm saucepan. Heats beautifully for perfect sauces. The only "negative" is I usually need 2 hands to transfer because of the weight. It looks so great, it stays on the stove. Personally, I prefer the matte finish of Falk to others (plus I dint have the time or desire to polish). I also prefer the traditional look of these handles compared to the new contemporary line. To each their own..... You can't go wrong with any Falk piece. 971 customers found this review helpful. Did you? Yes, I did! 962 customers found this review helpful. Did you? Yes, I did! Phenomenal! A beautiful pan. Great for slow cooked ragus, soups and stews. It heats up quickly and evenly as I've come to expect. This is another fantastic pan in my slowly growing Falk collection. I really couldn't be happier with this! 953 customers found this review helpful. Did you? Yes, I did! Cooking to a whole new level - it's almost scary! My new 24cm Falk Saucepan arrived yesterday. Seasoned it straight away in preperation of todays cook-fest (batch cook). Boeuf Bourguignon for 6, Chilli Con Carne for 6 & Bolognese sauce for 6. I cook all of these on a frequent basis and without a shadow of doubt todays meals were the best by far when cooked in this Falk pan. In fact, this pan is so large I could easily have doubled the portion sizes with plenty of room to spare. My only wish is that Falk produced a pan suitable for Indian restaurant style cooking. 917 customers found this review helpful. Did you? Yes, I did! Could put a small fire out with a pan full from this one It's big. Bought this as the largest of a set of 4 saucepans. They look great together on an open shelf in the kitchen - don't hide them away in a cupboard. Usual Falk high quality finish and feel. The major benefit of these saucepans - apart from the quality - is that they heat up much more quickly than a conventional steel or aluminium pan. 913 customers found this review helpful. Did you? Yes, I did! Great pan Bought a range of Falk saucepans and have been delighted with the performance. Beautiful, easy to clean and quick to heat. Perfect. 835 customers found this review helpful. Did you? Yes, I did!